Refreshing and Cleansing Botanical Blend. Our refreshing skin toner cleanses, purifies and soothes with a blend of botanical ingredients and herbs. 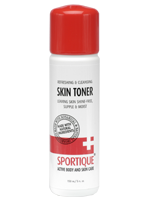 Apply SPORTIQUE non-drying formula liberally to clean dirt, oil and grime from your face and pores while restoring moisture and elasticity to your skin. Perfect to use after shaving, cleansing or for a pick-me-up during the day. Soothing botanical blend with Aloe provides cool relief for itchy skin leaving you hydrated, toned and shine-free. For normal to oily skin. Avoid contact with eyes.